Thanks, mom, for the memories. Anyone who understands figure skating knows it’s an expensive sport. There’s professional skates. Blades your local sport shop can’t sharpen. Hours of ice time. Coaching. Travel. Competition fees. And then, there’s the costumes. Growing up in a small town, Vera Wang and Tania Bass skating costumes weren’t part of the average agricultural family’s budget. So, the skating moms, aunts and/or grandmothers would make the costumes for the annual carnivals, competitions, test days, etc. If you couldn’t sew, there was always someone willing to lend a needle. Third from the left, dressed like a disco ball. When I was in CanSkate, I somehow avoided dressing up like a lion, strawberry or candy cane. With two girls in figure skating, my mom made our costumes and dresses – with a few exceptions. 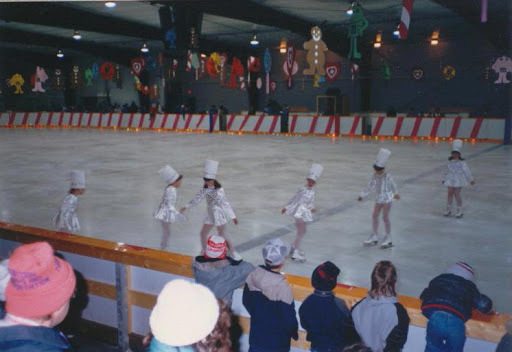 For the 1987 ice carnival, our CanSkate group was performing to “Boogie Woogie Bakery Man.” My mom was pregnant, and she recruited the help of a local seamstress. Since I was a baker, my dress was plain, clean, white satin. With zero stretch. When the seamstress finished the dress, my mom attached nickel-sized silver spangles. Tons of them. Everywhere. And then she plastered them on the front of my dress – like a mirror. I could’ve picked up cable signals. Of course, once I topped off the dress with my baker hat, I’m sure nobody noticed. I sparkled like a disco ball on the video. For my first regional competition, again, my mom contacted a seamstress. My sister and I were competing in Primary Dance and singles, and we needed something similar. Contrasting, but contrasting. We agreed on one thing: black. The seamstress pitched the idea of shoulder inserts in metallic material. Gold for my sister, silver for me – even though silver pretty much set the tone for my skating career. That custom dress made me feel like a princess. The seamstress even fashioned a little silver scrunchie out of the sequence. Like a tiara? Okay, not like a tiara, but sort of. But after a growth spurt over the summer, I couldn’t fit into the dress the next season. I felt horrible because the dress was pretty pricey. My hot pink spandex dress was another favourite. I was going through the Sears Christmas Wishbook, and, gasp! Sears sold skating dresses. My sister chose a calm ocean blue while I pounced on the hot pink. Mom spent hours painstakingly attaching a white lacy under-skirt to my dress, and a black lacy skirt to my sister’s. I had a hot pink lace “V” down the front and back with sequence – while my sister had black lace with the same theme. Spandex! I could move. Unlike my other dresses, I could easily pull on this dress in less than a minute. Which came in handy when I was almost disqualified from a regional competition. I went MIA. When I casually showed up, I had no idea the competition was underway. I had two minutes, or I’d be scratched. Frantic, I tore off my clothes as I raced to the dressing room. A minute later, I was rinkside – thanks to a clubmate who tied one of my skates and talked me out of on-the-spot retirement. Along with singles, my sister and I skated synchro – at the time called precision. For our second year, the 16 member team – along with the young teams – decided to have the same costumes: black spandex dresses with a pink and white ribbon scribble down the front. I remember my mom sewing and seam ripping, not one, but two, of those scribbles. Spandex is a difficult material to sew on one dress. Never mind two. Little did I know those dresses would be come iconic. The Arborg Skating Club used those costumes for years. My mom sold my sister’s dress a couple years later, but she held onto mine since I skated throughout high school. However, I thought, let’s revamp! We removed the scribble, because I wanted gold sequence. Lots! With colourful plastic hearts. Lots! I wore that dress for one competition. Today, when I mention or sent a photo of a dress to mom, she’ll always say, “I couldn’t make a dress like that nowadays.” This, from the woman who’s a master quilter. Realistically, with the price of material, lace, spangles, ribbon, pom-poms, sequence, hot glue and my mom’s time, we could’ve bought our dresses off the rack. But I remember those countless fittings with mom, and her saying, “Hold still. I don’t want to poke you. Hee hee.” Mom’s sewing machine buzzing late into the night before ice carnivals and leading up to competitions. Her “Ah, shoot,” and then the sound of the seam ripper. Those memories? You can’t buy those off the rack. Content added and post edited.